In the two previous posts, I introduced PowerShell Desired State Configuration (DSC) and the kinds of use cases that its suited to. Post #2 covered setup and configuration of the DSC Server and how target nodes retrieve their configuration. This post will now cover the nuts and bolts of the actual Powershell configuration file (script) that defines the Desired State. I’ve tackled this by picking a variety of common scenarios that IT pros come across, and for each show an example of the configuration script. In addition, as a “catch-all”, I also show a couple of “Script” resources, which basically allow you to implement your own custom DSC resource directly in the configuration file. (ie. without building a custom DSC Resource module, and distributing it as necessary). ⦁ Ensure pre-requisite updates, support packs or modules (MSU, MSI, EXE based distributables) are present on the node. 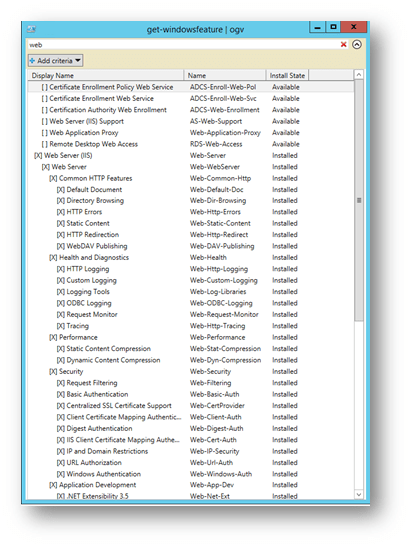 ⦁ Configuration of IIS Web hosting, app pools, web sites, and so on. The above defines four server configurations – note that the above works well for PUSH configuration mode, where we know what the Node name is, but we can also use for PULL configuration, but instead of considering NodeName to be that of a specific Server, you should consider it that of a specific server type. When building PULL configurations, we would rename the server type to use a GUID, and then assign that GUID to all the machine’s Local Configuration Management Config, so they know what configuration type to request during the pull operations. Now we have an array of nodes (called AllNodes), each of which has a NodeName and a Role. The NodeName will determine the configuration’s output filename, the role we will use in our logic flow to output the right kind of configuration for that role type. In the main powershell configuration script, when defining a specific Node, we can now use the AllNodes array to repeat the Node output for each Node based on a filter we define. In this case, I want to define three different sections – one that will produce output relevant to all role types, one for SQLServers and one for AppServers. Note that APPSQL1 will be a combination of the all three (ie. it matches All nodes, SQLServer and AppServer so all three sections will apply). By default, this will leave the Feature implementation to decide what sub-features will be installed, but you can also control this, by using the keyword “IncludeAllSubFeature”, and setting to $True or $False, as per below, where HealthAndDiags is a SubFeature of IIS. You can then specify subfeatures individually to ensure those are enabled or disabled. The xNetworking module, available from the powershell gallery, implements a DSCResource called xFirewall. This gives full control over the Windows Firewall with Advanced Security feature. This allows fine grained control over the specific rules and policies within the firewall. An alternative approach is to use the netsh advfilewall command within a DSC Script resource. The simplest way to ensure a timezone is set is to use the tzutil command line – this has a get (/g) parameter, so we can build a Get, Test and Set function, and use the built in DSC Script resource to ensure the timezone is set. The test function will be called to see if the timezone is already what we want, and if it is, the set will be skipped. Another DSC module is available from the Powershell gallery called xRemoteDesktopAdmin. Note that the x prefix denotes “Experimental”. In the gallery the naming convention prefixes “x” or “c” are used to indicate experimental or community versions (or if no prefix, it’s a production release). Typically modules stay in experimental for some time, and newer versions are usually released as experimental first. This does not cause problems, because the modules are downloaded at the authoring stage and from there pulled to the target machines, rather than target machines having a dependency on the gallery. 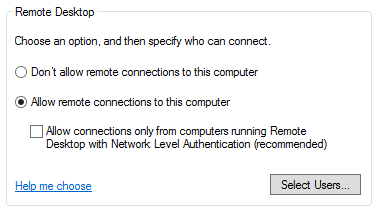 The xRemoteDesktopAdmin resource has been written specifically for setting the remote desktop availability on or off – the UserAuthentication setting matches the checkbox “Allow connections only from computers running Remote Desktop with Network Level Authentication (recommended)”. These support packs and modules are all distributed as MSU, MSI or EXE installables. The same strategy is used as per SQL Server install below, without the complexity of having to mount the ISO image. Add a script resource to test if the support pack is already installed, and a SetScript to execute the installer in the event it’s not already there. The strategy for deploying SQL Server to one of the target machines is to use the File Dsc resource and the Script Dsc resource. To author the deployment, we first need to create a silent install parameters file. This can be done by stepping through the SQL Server installation, selecting all the required components and parameters, up to the point where the installer prompts to click Install to carry out the installation. At this point, the configuration .ini file has been produced (the path is displayed in the installer UI). This .ini file can then be used by the target machines to execute the installation silently. A GetScript to return true if any instances of SQL Server can be found on the machine using the Get-WMI win32-service powershell cmdlet. throw "Could not mount SQL install iso at $imagePath"
$setupDriveLetter = $setupDriveLetter + ":"
$cmd = "$setupDriveLetter\Setup.exe /ConfigurationFile=c:\windows\temp\ConfigurationFile.ini /IAcceptSQLServerLicenseTerms=True /SQLSVCPASSWORD=P2ssw0rd /AGTSVCPASSWORD=P2ssw0rd /SAPWD=P2ssw0rd"
Another powershell gallery module called xSystemSecurity that can be used to carry out enabling/disabling of IE Enhanced Security Configuration for both users and administrators. The module called WebAdministration (https://technet.microsoft.com/en-us/library/ee790599.aspx) can be used to fine grain control all of the settings within IIS, including app-pools, sites, etc. Each set of controllable assets is provided with a Get and Set to enable building of a DSC Script resource. Most also have New- and Remove- commandlets, which enable you to provision new sites or app-pools directly. “There several ways to do this..” => There are several ways….